On December 13, 2018, Governor Snyder signed two bills to increase the minimum wage and grant a new paid leave. 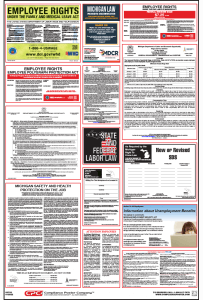 Employers in the state of Michigan are required to update their labor law posters to be in compliance with new state changes. Under the Improved Workforce Opportunity Wage Act, the state’s minimum wage increases from $9.25 per hour to $9.45 per hour starting March 29, 2019. The minimum wage increases again each January, reaching $12.05 per hour by 2030. Tipped employees will continue to be paid 38% of the minimum wage rate. Effective March 29, 2019, the tipped minimum wage will increase from $3.52 per hour to $3.59 per hour. The tipped minimum wage will continue to increase until it reaches $4.58 per hour by 2030. The law also clarifies that the yearly increase will not take effect if the state unemployment rate is 8.5% or higher for the calendar year preceding the prescribed increase. Michigan’s Department of Licensing and Regulatory Affairs Wage and Hour Division has released an updated Minimum Wage and Overtime notice that reflects the non-tipped and tipped minimum wage rates for 2019, 2020, and 2021. The updated posting also includes the names of the new governor and director of the Department of Licensing and Regulatory Affairs, and a new posting date. Under the Paid Medical Leave Act, employers with 50 or more employees will be required to provide employees with paid medical leave for personal or family health needs, as well as purposes related to domestic violence and sexual assault. An eligible employee must accrue paid medical leave at a rate of at least one hour of paid medical leave for every 35 hours worked. An employer may limit an employee’s accrual of leave to not less than 40 hours per benefit year. An employer will not be required to allow an eligible employee to carry over more than 40 hours of unused accrued paid medical leave from one benefit year to another benefit year. The leave will begin to accrue on March 29, 2019, or upon commencement of the employee’s employment, whichever is later. An employee may use the paid medical leave as it is accrued. However, an employer may require an employee to wait until the 90th day after commencing employment before using accrued leave. service or care as a result of domestic violence or sexual assault. The Department of Licensing and Regulatory Affairs has also released a new posting that covers information on this new law. Covered employers are required to display this new posting in a conspicuous location frequented by employees during the workday. An employer that willfully violates the posting requirement may be subject to a fine of not more than $100 for each separate violation. CPC’s Michigan All-On-OneTM Labor Law Poster has been revised to include the updated Minimum Wage and Overtime posting and the new Paid Medical Leave Act posting. Employers can order posters here, or by calling our Compliance Advisors at 1-888-339-1257.